IF A REGULAR MOM of three can make staggering £7,650 a month from home… then this is obviously something you should consider as well. Just to help moms like herself, Lisa White shares her money-making secrets in the Career Journal Online. If it is not, well… go and sign up. But if it is a scam… Better stay away from it. Here’s where this review will come to help you out. I will give you a detailed analysis on what the career journal online is and what it does for you. My Verdict: It’s a massive SCAM!!! 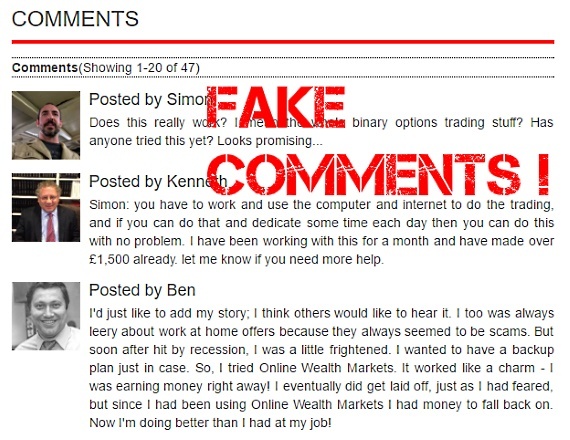 They are using all their tricks to make you invest into their Binary Options trading scams! Absolutely stay away from it! Listen! There are much better ways for stay-at-home moms to create a passive income online than dancing with high-risk Binary Options. You can check here and here for different options. However, if you are serious with it and want to break into complete financial freedom (make a full-time income online, become your boss and cement your financial security in old age) then your personal website is the way to go. The website is your online real estate, which is making you money while you are working, eating, playing, or sleeping. The Career Journal Online is supposed to be an online journal for those looking ways to make income online. It should guide you through various topics like finance, tech, investing, stock, etc. However, as I will prove it below, this so-called journal is an entirely different animal. And the dangerous one. So keep reading and you will see why I gave you this warning. 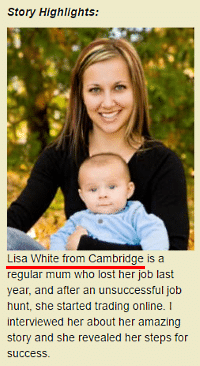 Lisa White is a regular stay-at-home mom from Cambridge, UK. She has three kids at home and (as it usually is) she lost her job. Sad! So sad! But instead of having a lonely pity party, she decided to improve her desperate situation. She started to look for honest ways to make money online. That’s how she found about trading online which sounded like a great opportunity to her (as she needs to stay at home with the kids). She dug deeper and discovered, it as was Binary Options trading opportunity – perfect for an inexperienced person like she was (Note! Contrary to this claim, Binary Options are NOT for inexperienced people. See here why). She always invests the same amount – in the beginning £300, later £250. According With Online Wealth Markets (the Binary Options trading robot Lisa uses) she has consistently enjoyed an 80% winning rate. She makes between £6,000 and £7,000 each and every week from home by trading Binary Options. Her current income from trading Binary Options is so good that lately she could buy a new BMW 5 series (see the image below). Also, few month ago Lisa’s family could turn their dream vacation in Maui, Hawaii, into reality (image below). Can you emulate the same results as that regular young mom of three from Cambridge? Well… Keep reading and I will show the true colors of her story. Their website – The Career Journal Online – is deliberately designed to look as a professional News Journal, specialized on online jobs. However, everything, EVERYTHING in it is an imitation. There’s no such legit journal as the Career Journal Online. Even their URL is jobsrecruitmentonline.com. And as I will show you below, this is just one of many, Many, MANY similar scam sites. Just keep reading. You can find NO information on Finance, Tech, Media, Portofilio, etc. Every singly button in the menu sends you to their Binary Options scam site. Facebook: 18K+ likes, 32K+ shares, Google+: 624 shares, etc. Hey! Another plain lie. Why? Because it is just an image – the non-clickable image. Nothing but an imitation of social sharings. To make you an impression as the article is heavily shared on social sphere. Better ALTERNATIVE to the Lisa Westbrook Home Profit System That Will Help You Make $1200+ a month Online. And these testimonials are proof. Again, pure imitation. None of these logos (Bloomberg Business, Telegraph, Financial Times) are clickable. The logos should build your trust but they are used illegally and thus it is nothing but deceiving. As you can suspect, the author of the article (Amansa Winston) is also bogus. First, you cannot find such person from the Internet. Second, all three links (the name of the author – Amanda Winston, and the two links next to it) lead you to the exact same binary options scam. As I will show you below, Lisa White, a regular mum from Cambridge, UK, who lost her jobs, etc., is a fabricated character. Let me give you some facts and see what you think. As I told above, The Career Journal Online is just one of the many almost identical scam sites. 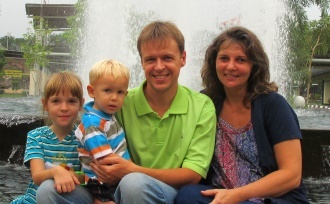 These sites target stay-at-home moms from different countries (UK, Romania, India, etc.). And that’s why they give their star mom Lisa White/Melissa Johnson each time a different name and different background. As you can see yourself, the photo is a stolen from the Internet and there is no regular mom Lisa White from Cambridge. The image is used to create Melissa Johnson from Craiova, Romania, Melissa Johnson from… from where exactly? See! 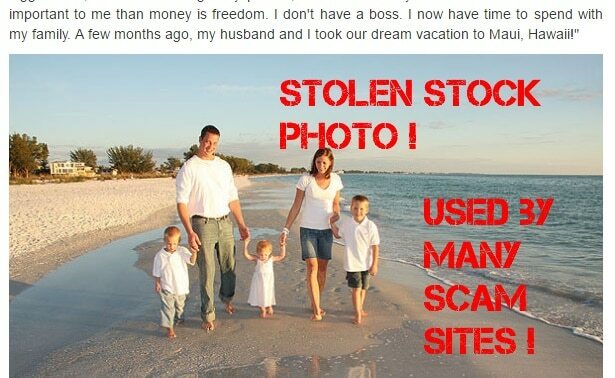 They use a template to create a plethora of different scam sales pages and trap as many stay-at-home moms as possible. There is more bogus stuff in the article and when you read further, you will learn the dirty tricks of scammers. 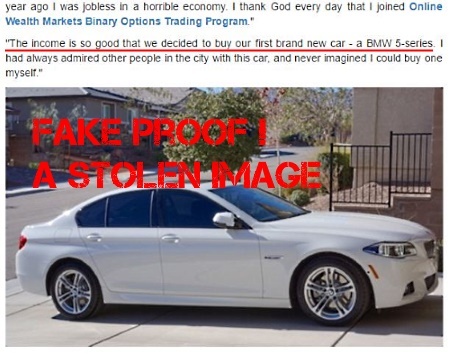 However, this photo is stolen from the internet (look here for a proof) and used in other scam sites as well. Make no mistake, trading Binary Options is high risk business and NEVER EVER suitable for an inexperienced people with zero financial knowledge. If there is anything incredibly simple in Binary Options at all then it is losing your money. Nothing is surer! I can tell you, these con-artists are real blood suckers who prey on beginners. Once you have signed up and funded your trading account, expect to fund it with even bigger sums AND never see your investments again. Now here’s another scam – Richard Branson Binary Options scam (Note! Richard Branson has nothing to do with it) – and it uses the same comments. Also, in that review I show you couple of other identical comments from different scam sites. As you might suspect already, all of them have the same Lisa White or Melissa Johnson (or Mette Sørensen from Copenhagen) narrative as described above. If this is not an outright scam then what is it? 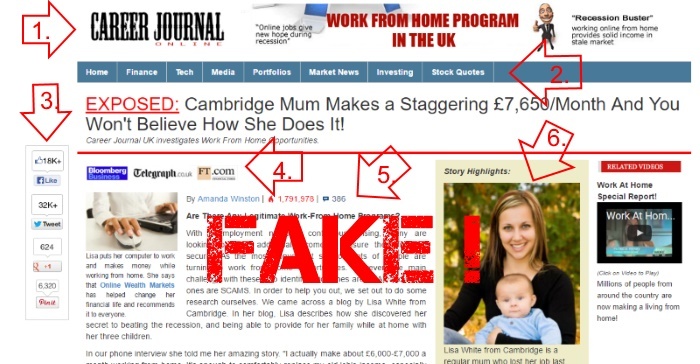 There is nothing true in the Career Journal Online and its article on the Cambridge mum who makes a staggering £7,650/month. 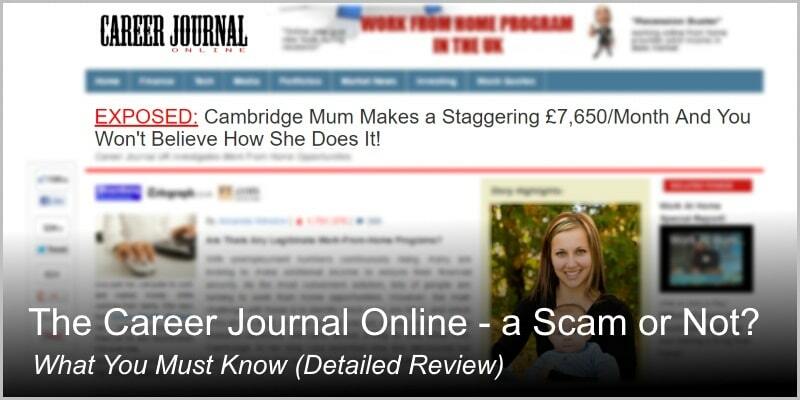 Verdict: The Career Journal Online is a dangerous scam sales page that tries to trick you into joining and investing your personal money with their Binary Options scam. Stay Away! When they go and buy, you will earn commissions. That’s how thousands of work-at-home moms make full time living (and not only moms). And that’s how you can too. Do you have any experience with the Career Journal Online scam that you want to share? Please let me know your views by dropping a comment below. Thank you very much for the encouragement and kind words, Sara. I am glad to hear you found the Career Journal Online review helpful. As you probably already figured it out, big majority of all these “work from home” ads link you to nasty scam sites. They keep touting you can be filthy rich by tomorrow morning and at the same time they are preparing for the kill. As Alice Cooper pointed out, the devil is smart. She is not going to come dressed in red pajamas with horns on her head. No! She will be disguised as something you can trust, or think you can trust… like some legit work-at-home opportunity. However, when you take a closer look, you will see nothing but utter deception (just like in the Career Journal Online opportunity above). If you compare that with Wealthy Affiliate for example, they’re as contrasting as night and day. Wealthy Affiliate, for example, never promises that you will get rich with a snap of fingers. Truth be told, it’s polar opposite. They tell that you can and will succeed online but you will need to work for it in the first place. You build up your own passive income stream and that very stream will bring you financial independence later. Even better, you can start completely free – no credit card required. It seems quite odd that the title is called career journal, yet it talks about trading binary options. These scams seem to be everywhere and its funny the lengths they would go through. I hear the most common thing they do is not only rent out nice houses but also use cash (not theirs probably) to place on the beds to make it look like they make lots of money. Hey Jessie and thank you for the comment. Also, thank you for the kind words. Yes, it is odd, isn’t it? These editorial style scams are designe to lure unaware people into different rip off schemes (including binary options). And hey, binary options trading is so awfully speculative and high risk business opportunity that they’re clearly not suitable for the average Joe (or Jane) on the street. And yes, I’ve seen that’ they rent luxury sports cars, nice villas, even private jets to shoot their promotional videos and make an impression as if they have made all those riches by that specific piece of full-automated software only. Yet, because the scam artists have studied human psychology, they obviously know how to strike the cord and make people pay through their nose. Utterly disgusting, to say the least. Thank you again for the comment, Jessie. Wow I have to admit, this is a very well written, well-researched review! Must have took days for you to finish but man, those stole images to make it look like they own them are really getting on my nerves. Very clever and well done for picking up all these ‘fake’ things within the site. It must have taken a lot of work on your part. My only advice to everyone is to look up reviews like this one on anything that you want to join, as somebody always has something to say about a home business, and this, in the long run, could save you a lot of money and tears. Thank you for taking your time and dropping me a comment. And thank you for the encouraging words. In fact, few years ago I fell a victim to a pretty similar scam. One of my student’s email account was taken over by scammers and they started to spam people in her contact list. However, this email was the very first one, that’s why I trusted her recommendation. Later, I found out it was a scam and her email box was used for spamming. But for me, it was too late. Therefore I completely understand – innocent people (especially if they know nothing about dangers in the internet) are just so vulnerable. These con-artist paint a rosy picture before their eyes and tell it is super simple to make 4 or 5 figures per month and you have many who are already running to sign up. Sure way to lose money. That’s why I write these reviews – to warn innocent people and protect them from all kind of devilish fraudsters.